I once had a large supply of the powerful magnets shown in the photo (front, right), but the last time I went shopping for more I couldn’t find them. What I did find at my hardware store were magnets without the handle. So I decided to make my own magnetic stud finders using wire nuts and super glue, as shown in the photo. I filed the top of the wire nut as flat as possible, put a drop of super glue on it, pressed it onto the middle of the magnet and (following instructions on the glue tube) let it sit for 24 hours. I really wasn’t sure this would work, as I expected the two parts to separate when I pulled the magnet away from a metal object. But it has worked just fine. I’ve now made four of these DIY stud finders. To use them, just slide one around a wall until it sticks by itself. Now take another and do the same thing above or below the first one. Once you have three or four of these lined up vertically on your wall, you can envision the stud standing behind them. Mark the spot, and you can be sure that any nail or screw you drive along this path will safely embed itself in a stud. You don’t have to use wire nuts for this project; I just happen to have a large supply of them. A short piece of wood would probably work just fine. 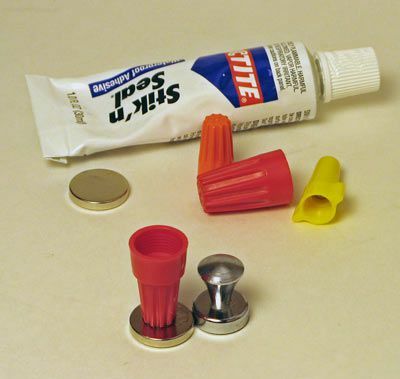 And you don’t need to use these homemade items only for finding studs. They can also be used for refrigerator magnets, for hanging keys from the wall, or any number of other uses. For information on other stud finder options, check out this stud finder. Which Elmer's Wood Filler Product Is Best?